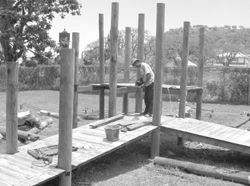 The children at the School for Children with Special Needs will soon have a refurbished playground at their disposal. Public Relations Officer of the Rotary, Joe Sheridan, stated the wood that was used to hold the slides and swings together was rapidly being devoured by termites and that something needed to be done. He mentioned that in the initial stages they thought that the playground only needed painting, but further investigation proved that much more needed to be done. Sheridan said the re-construction is budgeted at $10,000. The playground was constructed about five years ago with help from Rotarians in Canada.